Since its inception in 2011, the annual Kenneth G. Wilson Award for Excellence in Lattice Field Theory has recognized physicists who have made recent, outstanding contributions to lattice field theory. 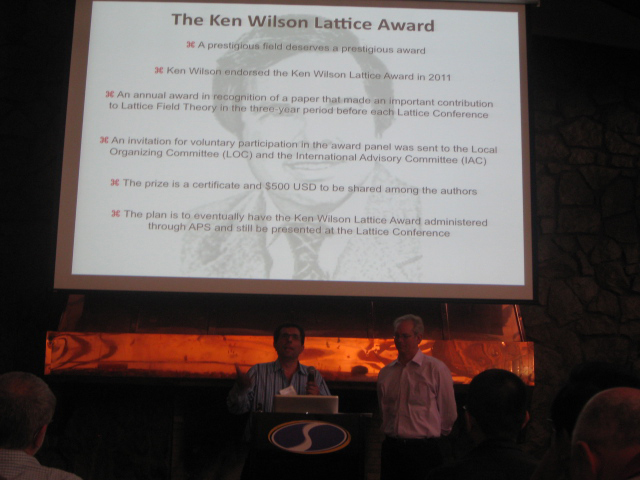 The award is named after Nobel Laureate Kenneth Wilson (1936–2013), who founded lattice gauge theory in 1974, permitting such theories to be studied numerically using powerful computers. Wilson endorsed the first award by writing a letter to the community reaffirming the importance and research challenges in this field of physics. For fundamental contributions to lattice field theory in a finite volume that are essential for performing lattice simulations of complex systems. 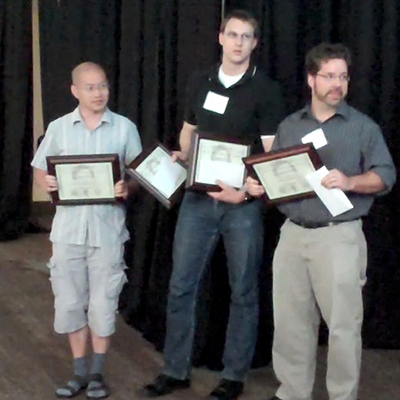 For groundbreaking contributions to the study of resonances using lattice QCD. For outstanding contributions to our understanding of electromagnetic effects on hadron properties. For substantial and timely contributions in new research directions in physics of the bottom quark using lattice QCD. For significant contributions to our understanding of QCD matter in strong magnetic fields and to QCD thermodynamics. For significant contributions to our understanding of baryons using lattice QCD and effective field theory. For their paper titled “The K → (π π)I=2 Decay Amplitude from Lattice QCD,” which addresses one of the longest-standing challenges in our field. This work has led to the first reliable results in weak kaon decays. For their paper titled “Two-flavor QCD correction to lepton magnetic moments at leading-order in the electromagnetic coupling,” which describes a new application of lattice methods, applied in a timely fashion, and making an impact on an important (current) discrepancy for the muon magnetic moment. 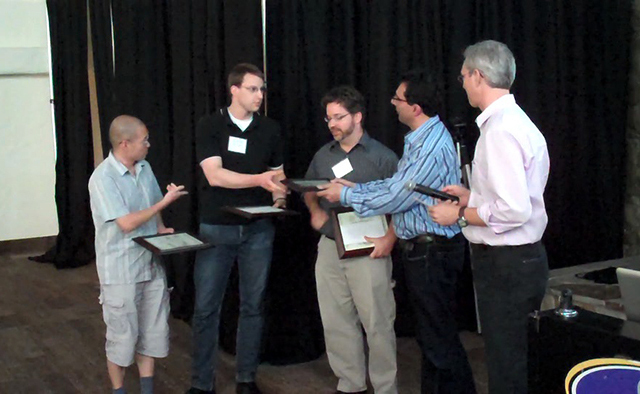 To recognize outstanding contributions in lattice field theory. The award recognizes outstanding physicists who are within seven years of completing their PhD at the time of nomination, plus any career breaks. The research recognized could either be a single piece of work or the sum of several contributions. The nominating letter should include a proposed one-sentence citation justifying the award, and all letters should explain and justify why the nominee should receive the award. Nominations will be reviewed in the year received and remain under consideration for two additional years. For second year and third year reconsiderations, augmented information can be submitted to the selection committee. Nominations of scientists from all nations are solicited. Self-nominations will not be considered. Recipients are not eligible for a second award. Each year, a panel of voluntary judges reviews the nominations. For nominations submitted for the 2019 award, nominees must have received a PhD (or equivalent) after December 31, 2011, with suitable adjustment in cases with career breaks. As stated above, nominations will be reviewed in the year received and remain under consideration for two additional years. Nominations should be emailed to the chair of the selection committee before March 17, 2019.